Strain-relief collar absorbs stress and reinforces the juncture between the cable and the connector head to prevent falling apart. Proven in testing to withstand 5000+ bend high-speed charging and sync this cable is built with high quality copper core to provide higher conductivity to ensure maximum charging and syncing speed. 3-foot cable extra convenience: 3ft(1 meter) lightning cord is perfect for you to use your device while charging. Our lightning to usb cable with 3feet in length is tangle-free and flexible to keep. Package contents 6pack 3ft white lightning to usb cable. Reliable iPhone Charger: Polished housing not only pairs perfectly with your devices, but also protects against physical stresses. 12-Month Warranty Policy: Full refund or free replacement against defects in materials and workmanship within 12 months without any hassle. 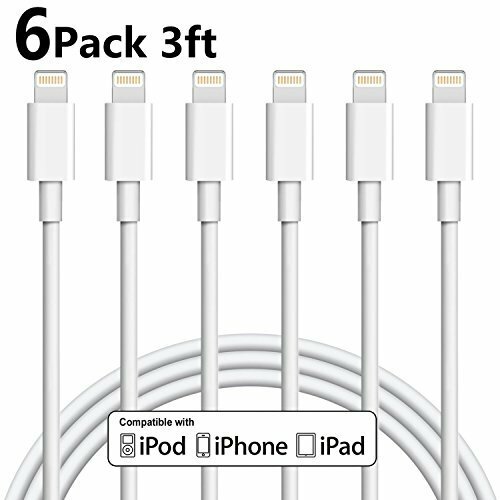 Value Pack: With 6pack 3ft iphone charger in one package, enjoying an inexpensive high-quality item. If you have any questions about this product by Xcords, contact us by completing and submitting the form below. If you are looking for a specif part number, please include it with your message.